Able to add and see upcoming events but Events page does not work. I’m sorry that you’re running into this issue, but I’ll be happy to help you out! First, I see that you are running a much older version of The Events Calendar – can you try updating to the current version (4.6.21)? You’ll also want to upgrade to the current version of Events Calendar Pro (4.4.30.1) and make sure you’re running the current version of WordPress (4.9.8). If you don’t see a prompt to update in the Plugins section of your Dashboard, you can do so manually by following these instructions. Please let me know if this gets things working for you! I will give these a try and get back to you. I am out of the office the rest of the week and will get back with you as soon as I come back to work. Just wanted to let you know so the ticket does not get closed. No worries, this will stay open for 3 weeks of inactivity by default. But if for some reason any of your threads ever do get closed before they are resolved, you can always open up a new one linking back to the original one, and we can continue from there. I have confirmed that the WordPress, Calendar and Calendar PRO are all up to date. What would be the next step in figuring out why this link is broken? Thanks for running those updates! You’ll also want to clear out any caching that you might be doing on your site (on your server or via a plugin). Next, try running through the steps outlined here to see if any of these resolve the 404. If not, then the next step would be to run through these instructions (or use a plugin like Health Check) to check for any conflicts that might be occurring with your theme or another plugin. This basically means dropping down to a completely default environment (all other plugins besides The Events Calendar and Events Calendar Pro disabled and a default theme like Twentyseventeen enabled) to see if the issue is still occurring. If not, then you can re-enable the other elements on your site one at a time to see when the issue reappears. Please make sure to have WP_DEBUG enabled during testing and copy/paste any errors that you see into your reply. I tried everything listed in your suggestions but still nothing. Here is the DEBUG info.. Thanks for sending that info! It looks like this issue may be due to a conflict with the Search Engine Visibility plugin. Can you try deactivating that and see if that this then works? If not, just to double check – were you still seeing this issue in a completely default environment (all other plugins besides The Events Calendar disabled and the Twentyseventeen theme enabled)? There are a few other steps that you can try as well – can you also try running through the steps in this guide to see if this fixes the 404? I did test it with every plugin disabled and used the Theme recommended but still got the same 404 error. I added the code to the funtions.php file but that also did nothing. I also flushed the permalinks as instructed but still the same results. I am not too PHP savvy so I am trying not to make things worse by editing critical files etc..
Could this be a possible issue? PHP Version  5.6.30 – For best performance we recommend using PHP 7.2 or higher. Thanks for running through those steps! I created a new testing environment locally using PHP 5.6.3 to test this out, and the events page was working for me there. 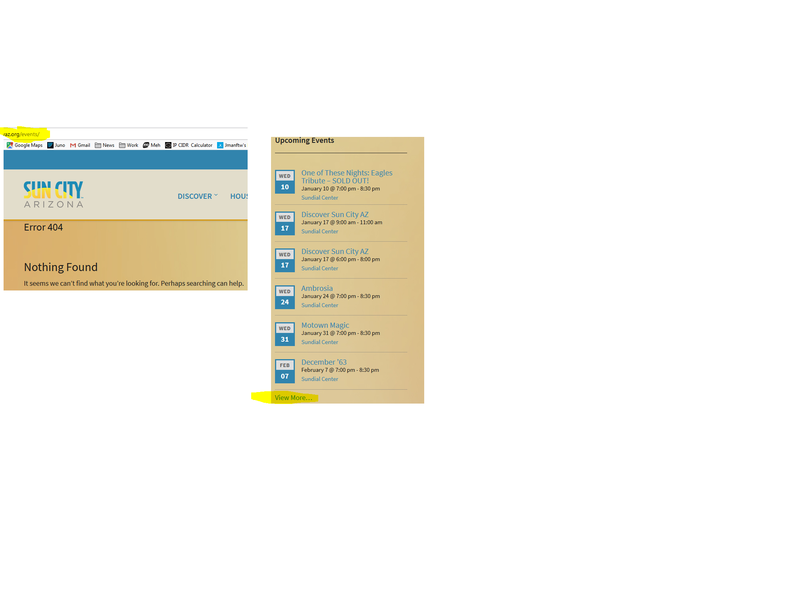 Do you have any other pages on your sites that are trying to use the “events” slug (such as a Page named “Events”)? The Events Calendar should use the default events page instead in these situations, but it’s possible that this could cause a conflict if there is a competing “events” page. If you find one, can you try changing the slug of that page, flushing the permalinks, and taking another look at the page? If not, can you try changing your events slug under Events > Settings > General > “Events URL slug”, flushing the permalinks, and see if you are getting anything then? Since you were still seeing this issue in your testing environment (with all other plugins disabled and the Twentyseventeen theme enabled), please make sure to try these changes there as well with WP_DEBUG still enabled. If possible, please send a link to your testing site so that I can take a look. I also reinstalled the Calendar plugin just in case but that also did no work. There were no other pages with the slug “events” although I did find a slug named “Upcoming-Events” and tried changing that but still nothing. Thanks for running through those steps! We have recently identified an issue where, if a default view is set that is not enabled in the “Enable event views” setting under Events > Settings > Display, the main events page is resulting in a 404. Can you take a look at these settings on your site and make sure that your default view is enabled? Thank you very much for your help and I have finally been able to see the calendar. One more small issue before I let you go! The Calendar has the same color for the days as the background and it looks kind of tacky, is there a way to change this? I have an example for you. No problem! I’m glad that fixed it – it technically shouldn’t be possible to set a default view that isn’t enabled, so we are working on getting this glitch resolved on our end. Apologies for the inconvenience this caused! There are a couple of ways that you can change the colors. Thank you for your help with this issue I will mark this as resolved on my end. No problem! I’ll go ahead and close this out, but feel free to open up a new thread if you run into any other issues. The topic ‘Events Page Not Found’ is closed to new replies.